Certain loves start this way, suddenly. Is the soul, before the head, that kicks off. The love for the time trials started from inside, a feeling to beauty, wind, speed that caught me like the ancient gardens’ ivy that you don’t control anymore. The time trial is loneliness. Inside and outside. The audience and the noise don’t matter: is a business between legs’ synchrony and heartbeat. But nothing is poetry. Because loneliness is raw like a stomach’s cramp and at the same time it shows yourself, who you really are. What you can do, in command of your humanity. 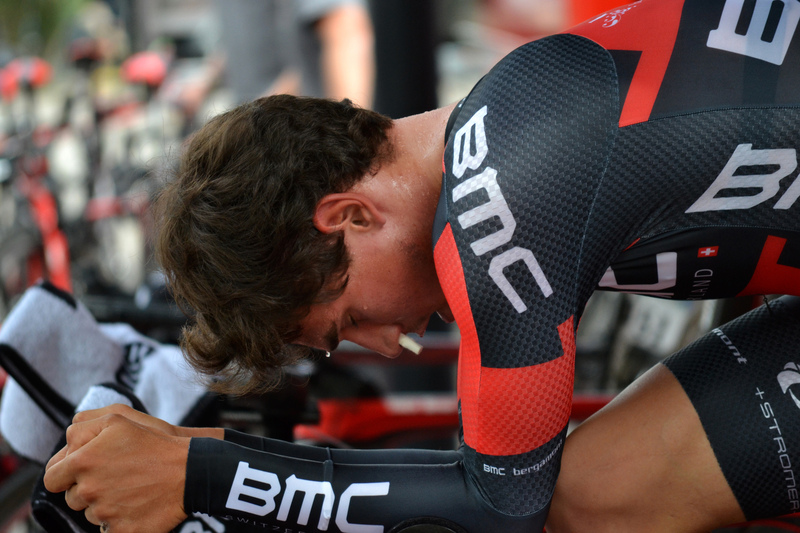 While I was walking around the busses, before the time trial prologue of the Tour de Romandie I’ve been impressed by Silvan Dillier, on his rollers: red and black BMC suit, head down, full power legs which pedal aimlessly. Warm up before the start, as usual. I don’t know what made me stay there, observing him more then everyone else. Maybe because he was there alone, without any teammate, without any audience. Maybe his motionless profile, with eyes down and sweat drops that fall like rain on his arms resting on the bike’s appendixes. I had never seen anybody else doing the rollers in that way. I look at him better: he doesn’t have headphones which help him to get away from the outside world, with music, nevertheless he seems not to care about what happens around him. The motionless profile, those little cotton cylinders in his nose, now soaked, the impassive gaze of someone who is somewhere else. Then, without stop pedalling, he close his eyes, he lowers the head even more. So, with the mouth half open due to effort, he seems to enter definitely in his dimension. Legs keep pushing on pedals and that’s the only thing that he seems to feel in that moment. That instant which is a mix between concentration and estrangement, it has the power of a hurricane. Even if outside, out of that body, everything has remained as it was. What are you thinking Silvan, in that moment? I don’t know and I can’t even imagine it. Maybe heaps of things, maybe nothing. Nevertheless I feel that in those closed eyes, in that lucid expression due to fatigue there is the same intensity we have in our solitudes, our estrangement from everything in order to feel a wind that doesn’t exist. How many times do we imagine that wind. We build in our mind the feelings we need to go on. And fantasy saves us, if we close our eyes. What do you think Silvan while you imagine the way, the team car yelling into the speaker to incite you, the deaf sound of the lenticular wheel? What is like trying to fell the wind on that motionless bike, with closed eyes while the sweat drips like tears? Maybe it’s like when we’re alone, even in the middle of a crowd and we think just about what make us shiver and the soul suddenly understands that is a moment of head and heart together. The wind during a time trial makes you thrill, you can feel it, you can feel the speed on your muscles that would like to win it. Winning against the wind and the time on a bike, being all one with her and with ourselves, a compact arrow for those kilometres that you have to do with full power, from the dais to the finish line. Seconds which flow together with the world. The road, the people, the houses, the little wall of a bend, fast stripes swallowed by the speed, that don’t have the time to materialize in the head that is the same somewhere else. Stoop on the appendices, only the fatigue is loud, the rest whispers. This can be imagined only with closed eyes and with the fatigue in the blood. Is like when we’re in the dark and we try to imagine the light. It’s the head, it is the soul with its parallel life. As it often happen I can’t explain with words the imperfect beauty of a moment that I feel deeply above everything else which happen. But I know that the next time that I will look to a guy on the rollers I will think about Silvan Dillier’s expression, about his way of pedalling aimlessly. I will think about how many times we do the same. About how many times we build a moment while waiting to live it, hoping that feeling it in the head and in the muscles before we would be more ready when it will all be true. About how many times we isolated ourselves from the rest of the world to find out who we are and to listen to what is important, again. About how many times we keep our eyes closed in order to hear that wind that is not there yet.